When selecting mobility equipment for bariatric clients, there are a number of specific factors that are important to consider, particularly when it comes to seating. In a recent blog, our friends at Seating Matters outlined the most common mistakes and challenges that healthcare professionals face. The most common challenge for clinicians in seating patients with a bariatric condition, is in getting the measurements of the patient correct. This can be often a daunting task and clinicians might require extra help from another clinician to make sure the measurements are as accurate as possible. A patient is more at risk of developing pressure ulcers in interface areas if the seat is not making maximum contact to load the body. Improper loading can lead to an uneven distribution of weight on interface areas. The seat depth and seat height needs to be adjusted to match the patients’ leg length but must be at an appropriate length so as to avoid pulling the patient forward and into a sacral sitting position. On the few bariatric chairs that do have tilt in space, they often do not come with appropriate footplates. 19% of a person’s weight is exerted through the feet in sitting, a key area prone to pressure ulcer development. However, with patients who have a bariatric condition, this percentage can be greater due to the weight of the abdomen resting on the legs. 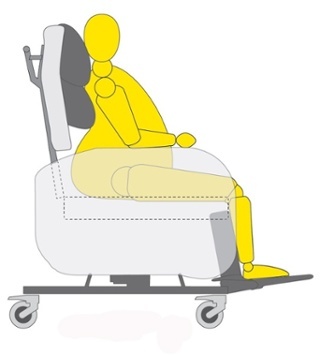 When chairs do not have footplates and are reclined or titled, you are actually increasing the interface pressure instead of decreasing the pressure the patient experiences. The correct leg rest and calf pad is an important function to consider in seating patients who have a bariatric condition. With larger calves, there is often increased risk from falls during standing as the feet can be positioned far in front of the patient when the calf pad does not accommodate the mass of the patients’ legs. The leg rest must accommodate larger calves to help maintain a typical 90degree knee flexion posture, and to enable a safe, stable standing position. It is well known that tilt in space can aid repositioning, improve respiration and reduce the risk of pressure ulcers. For patients with a bariatric condition who have decreased mobility and other medical issues, often the need for tilt in space is magnified but many bariatric chairs do not provide this important function.